Congratulations to Scott Sisbarro and Sue Griego AKA SueBallz (for her love of wallballs) on being October’s Athletes of the Month!! 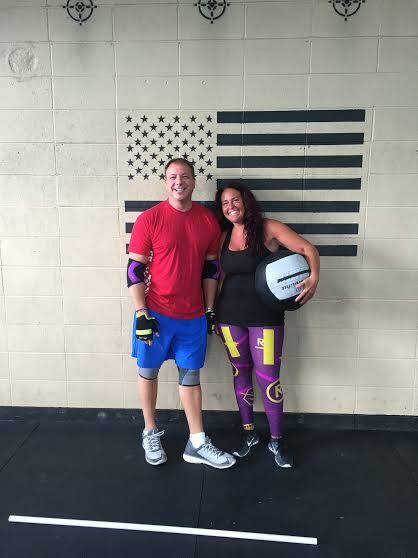 Scott and Sue walked into CrossFit a little over a year ago and have been regulars in the 9:30 AM class ever since! These two have made such amazing progress over the past year and have remained eager to work hard and continue that progress. It’s an extremely rewarding feeling to coach Scott and Sue. I always look forward to seeing these two every Monday, Wednesday, and Friday morning. Scott and Sue never fail to make people laugh with their raw humor and insane dance moves. They will brighten your day and make you instantly smile. Their personalities are contagious and I don’t know anyone who wouldn’t want to be around them. Besides their silliness, they are two of the most generous people I have ever met. Scott and Sue are truly amazing people and CrossFit HCC is so grateful to have them as their athletes. Here’s a word from Scott..
Why did I join CrossFit? A friend of mine said we should give it a shot and three of us walked in with no idea of what we were about to embark on. The first class made some of the less used muscles come to life. I liked the sense of family and the care that was given to us newbies. We were more than clients but became the children eager to learn what the coaches were invested in. I have been active all of my life. I am a dance studio director, teacher and choreographer and have been dancing since I was 9. I am not afraid of pushing myself. I really don’t mind being sore, it is something I am used too and in a sick kind of way enjoy. Dance is very different than CrossFit, I was used to finishing a routine and then discussing what went wrong and how to fix it, I never had some one yelling at me and telling me to ‘push!’ or ‘you can do it!’ or ‘come on Scott!!!’. I am getting older (as we all are) but I am closer to 50 than most of the ‘kids’ at HCC, and I am trying very hard to keep up. I have had surgery on both hips the past 6 years, one resurfaced and one replaced, much too young to have that done but at the time I was unable to walk up stairs after teaching 4 dance classes. CrossFit has helped me become stronger. My hips do give me mobility issues when I am working out but I try not to let it stop me from getting the best work out I can. I have only ever been with the 9:30 am crew; I don’t know how they would take me in the afternoons. I love singing out lyrics to the inappropriate songs blasting on the stereo and I will bust out a dance move in the middle of a WOD. I love the fact that workouts are named after body parts like snatches and balls. I am the one decked out with purple elbow sleeves and blue knee sleeves, work out gloves, a psychedelic cat shirt, miss matching shorts and the occasional bandana around my head. I will admit that I was warned ‘not to drink the Cross Fit juice’ but I am afraid I am addicted to it. I am frustrated when I miss a day due to travel or meetings; I have made up my own WOD’s and worked out in hotel parking lots. I feel that I am stronger, healthier and will some day find my abs under the flabs. The morning crew of Stef, whose time I am always trying to keep up with, Ashley who I can gear my weight too, Andrew for the occasional yell of encouragement, Jimmy for a kind word of advice and my work out bud Kyle; all make the time fly by. SueBallz and I are still here after a year and are leaping with both feet and hoping to keep landing on the box each time. I am becoming a better ‘ME’ and Coaches Matt, Court, AJ and TJ are making sure of that. And here’s a word from Sue.. I began CrossFit about a year ago. Instantly I knew it was a perfect fit for me. Although it was super tough at first, I became addicted just after the 1st WOD. Being overweight all my life, but super outgoing, I was always self conscious about myself. CrossFit has never made me feel like I wasn’t good enough or unable to accomplish what all the other athetes were doing. CrossFit did the complete opposite. 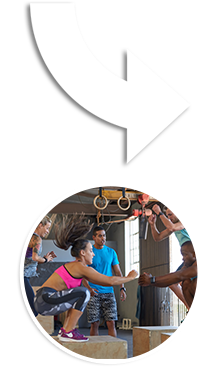 Coaches Matt, Courtney, TJ and AJ are always there to guide and teach you the proper techniques on working out. Most of all they have made me feel very comfortable. For that alone I am very grateful. 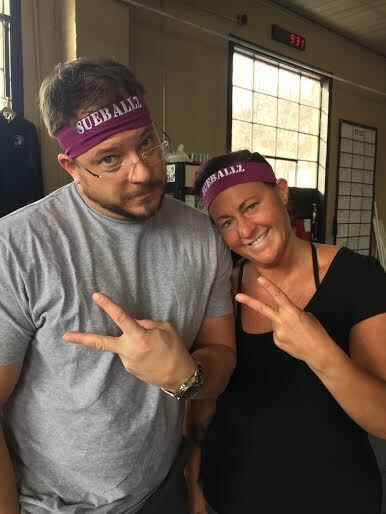 I am always greeted when I walk in as “SUEBALLZ” a nickname I earned for my love of wallballs! To coaches Matt, Courtney, TJ and AJ, you all have taught me to be dedicated, to push harder and that hard work & sweat does pay off! Thank you for not only being my coaches but also my good friends. Also thanks to my partner in crime Scott for your dedication and many laughs at 9:30 class!